On roads where there are generally not safety concerns, weather can present unique challenges. With increased friction in bad weather, vehicles are more likely to travel too fast and collisions become more frequent. 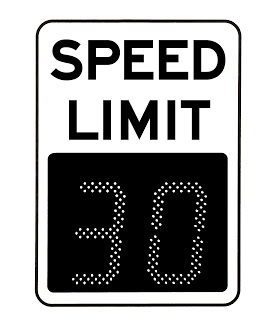 In the city of Lethbridge, ON, the municipality used the SafePace 550 variable speed limit sign to simply change the speed limit in bad weather. The SafePace 550 displays the speed limit and can be programmed to change based on weather reports or even in the moment when weather takes an unexpected turn for the worse. The signs were installed on a roadways with average daily traffic of 50,000 vehicles and a long history of weather related collisions including multi car pileups. The SafePace 550 was used in conjunction with the SafePace Cloud to program the sign remotely as well as to gather data and record traffic statistics. The sign proved a powerful tool in lowering vehicle speed limits, and remarkably, there were no collisions reported at all during weather events when the speed was reduced.